This week's challenge was to use your favorite color combo. I LOVE Orange and Aqua, so that's what I went with. Add a little green and it's perfect! I used this cutie patootie Street Corner Josh, colored him with Copics and cut him out. I popped him up on a square that I sponged with Aqua Mist and embossed with the CB Seeing Spots EF. The dp is My Mind's Eye Lime Twist Fly A Kite, and the sentiment comes from the Verve set Enjoy. Sparkle Creations Rubber Stamps is also sponsoring Sweet Sketch Wednesday, so I used this week's sketch for my layout. Time to go start some dinner:) Thank you so much for stopping by and have a wonderful evening! Hi Kerri, I just love your card, what an awesome image and it's the most perfect masculine card. Love your embossing one of my very favourite I should use it more often. Also love your colours and embellishments. Great job and thanks so much for sharing your card with us at Sweet Sketch Wednesday this week and good luck. What an awesome card!! That orange just pops off the page!! Beautiful papers and great colour combo.A really fun image, and fabulous colouring. This is just so cute! I love the color combo you have used too, perfect! Wow, absolutely colored to perfection! I love all the detail work you have added to your card. It is super cute! Thanks for joining us. Oh my goodness what a fun card, I swear girly you always rock at your colors!!! LOVE this combo and what a GREAT layout too!!!! Gorgeous Kerri!! I just love your choice of colors and dp!! Gorgeous coloring!! Perfect combo all around! 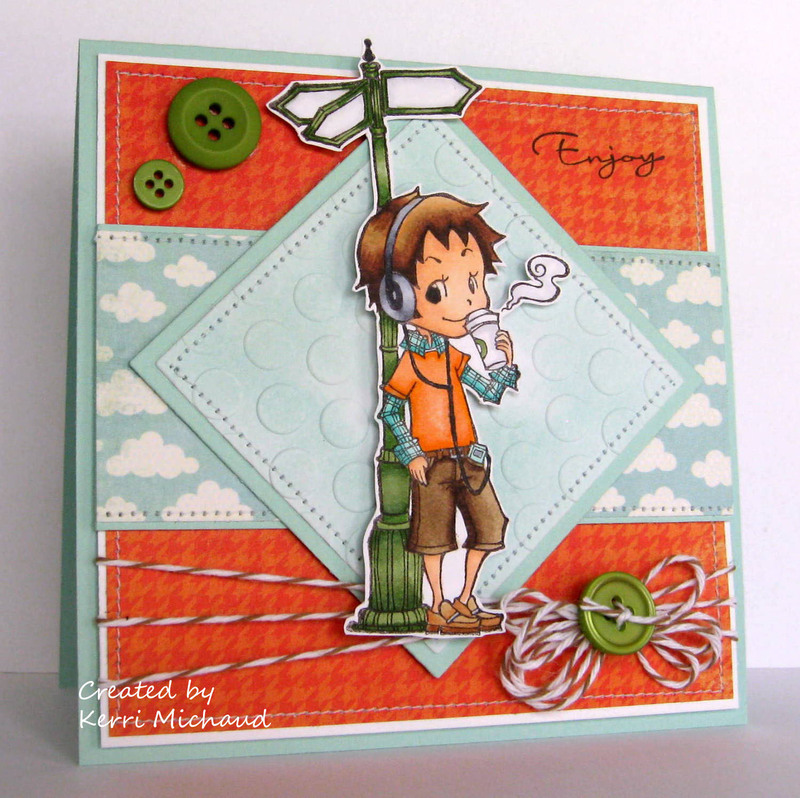 Love the image, colors and your fun twine and buttons along with your stitching and embossing! Oh how cute it is, Ms. Kerri! And so time-appropriate! While working the GASC (convention) last week, I was amazed at how many peeps were zoned in with their earbuds & carrying Starbucks or other yummy concoctions! Oh such an adorably sweet card. I love your paper and such sweet detail. Have a sweet week. Arlana@SSW!!! GOR-GEOUS! Love your clean lines and details. Love the papers too! Thanks so much for playing at Sweet Sketch Wednesday. What a beautiful card Kerri! Wonderful details and a pretty image! Oh my goodness, love, love, love this card!!!! So much wonderfulness! Love everything about it! Thanks for joining us at SSW. What gorgeous bright and crisp colors! Your image is colored perfectly and all of the embellishments are just awesome! Thanks so much for joining us this week at Sweet Sketch Wednesday. wow ~ fabulous card chickie ~ lovin those crisp fresh colors..and what a yummy colored imaged ~ beautifully done! Fantastic card - love your layout and the color combo! Thanks for joining us at Sparkle Creations this week! Fantastic card, Kerri! Really love these colors together! Love the embossed panel too! Your coloring is awesome!!! :) You really rocked this challenge!